The R.O.S. Therapy system is a great resource for caregivers. Mental handicaps, whether from birth, accident or injury, or a side effect of disease and aging can impact social and emotional health. Depression, loneliness, and despair are all common in those with mental handicaps. Cognitive decline can make it difficult to remember things, to pay attention, to problem solve, and can lead to slower motor skills, which makes connecting socially a challenge. Social interaction is often very difficult for those with mental handicaps, which can be one of the most debilitating side effects and one of the most crucial to well-being. Playing games can be a great way to connect with those with mental handicaps. 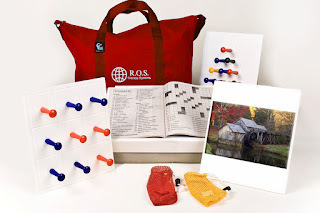 Games are not only a fun way to engage patients, and provide entertainment and socialization, but when carefully selected they can add substantially to their functional abilities. The biggest obstacle is finding games that can challenge the individual with mental handicaps without adding to their level of frustration. 3. No cards to hold. 4. Nothing that requires regular need for muscle control. 5. Nothing that requires a lot of verbal communication. The games need to be simple to understand and play without a lot of rules to memorize or tricky strategies to master. They have to be able to be played in a short enough time that the players can keep focus and follow the game without relying too heavily on memory. Because motor skills are often impaired, it is important to not require the players to hold cards or be secretive with pieces. Muscle control can be difficult, so not requiring regular, repetitive movements, or a regular need for muscle control is important (sports are out), and because many mental handicaps impair speech and communication, it is important to not require this in play. This can seem like a big list, and it may feel like there are limited options. However, the R.O.S. Therapy System is a great option for those with mental and physical handicaps. This system offers an easy to clean and care for gaming console that is designed to allow various activity boards to slide in and out to provide variety and ease of use. This system can be individualized, and is engaging. The pegs are large and easy to hold and move. The games are simple, but enjoyable. It encourages socialization, but also provides games for individual play. It can help with cognitive and physical function, increase self-worth and pride, and provide a great outlet for creative expression and fun. The R.O.S. Therapy system helps to naturally stimulate memories and conversation. It is a great resource for care givers, and can be a jumping point for sharing memories. It is simple to use, innovative and highly effective that puts the individual with mental handicaps back in control. This gaming option offers moments of contact and enjoyment despite difficulty with communication and physical limitations.